Language Level Bindings : Bindings refer to the language level bindings with which we can implement the Selenium Webdriver code. In simple words, these are the languages in which we can make a framework, which will interact with the Selenium Webdriver and work on various browsers and other devices. So we have a common API that has a common set of commands and we have various bindings for the different languages. Some Language level Bindings are Java, Java, Python, Ruby, there’s also some other bindings and new bindings can be added very easily. 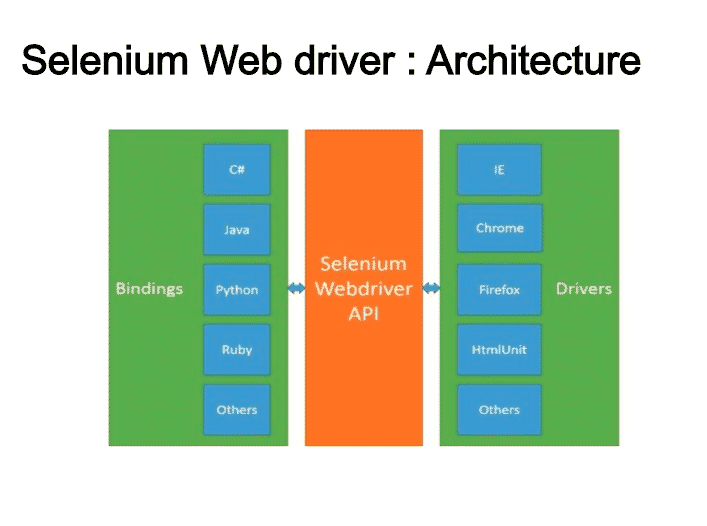 Selenium Webdriver API: Selenium Webdriver API sends the commands taken from language level bindings interpret it and sent it to the Respective driver. In basic term, it contains set of a common library which allows sending a command to respective drivers. Drivers: Drivers refer to various internet browsers such as IE driver, a Firefox, Chrome, and other drivers such as HTML unit which is an interesting one. It works in a headless mode which makes text execution faster. It also contains mobile specific drivers as well. So the Chrome driver knows how to handle the low-level details of Chrome browser and drive it to do things like clicking the button, going into pages, getting data from the browser itself, the same thing for Firefox, IE, and so on. 2. 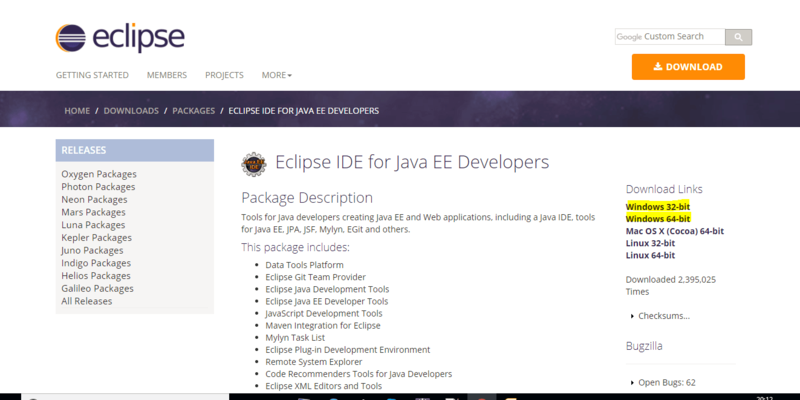 Click on Eclipse IDE for Java EE Developers. 3. Download depending on the bit size of your system. 4. Once it completes download right Click on the .zip file and extract it. 5. After extraction Double click on the Eclipse Icon. 6. It will ask for the workspace location by default it creates the workspace in Documents you can change it as desired. 8. 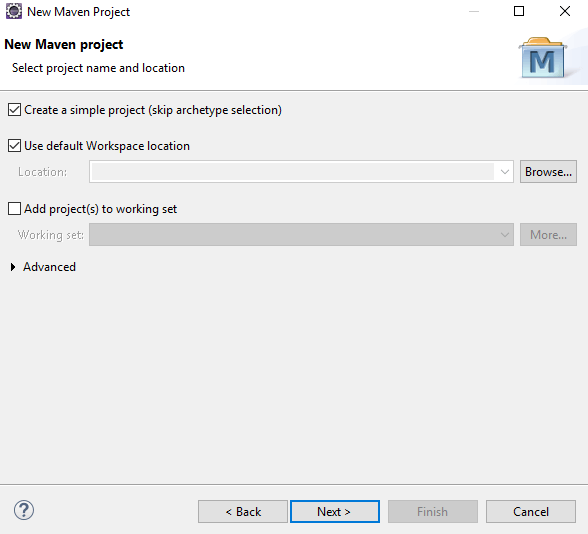 To Create new Maven Project Click on file ->New->Others->Maven Project and Click on Next. 12.After clicking finish you may screen like this. 2. 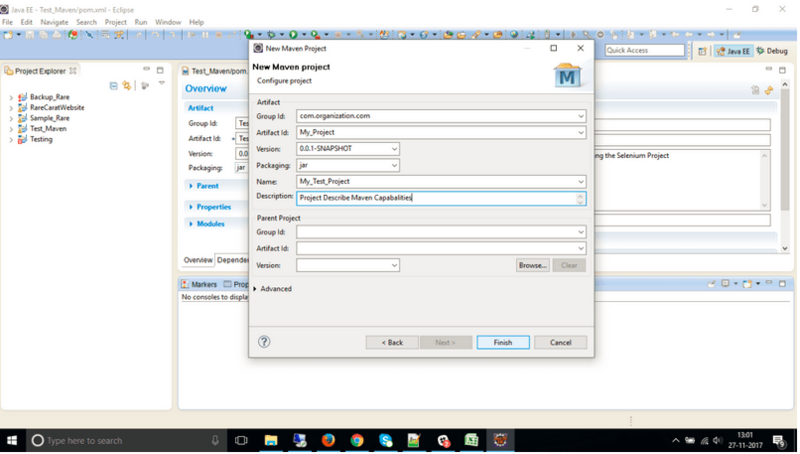 Selenium Dependencies would be downloaded and can be viewed in Maven Dependencies. Java topics for Selenium we need to cover. Is it complex to move from Manual testing to Automation? 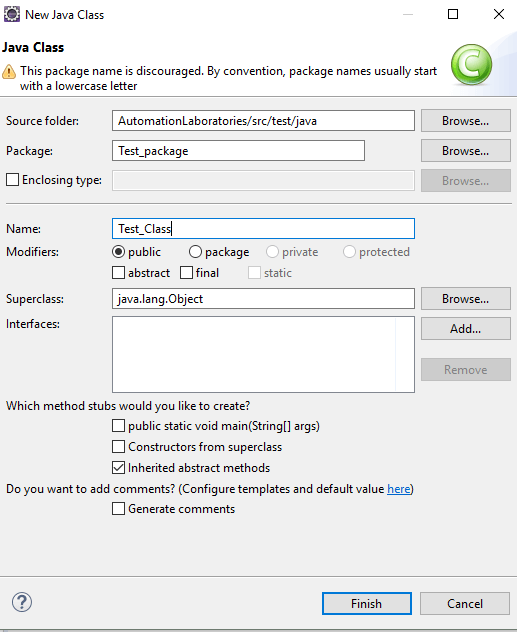 What concepts of Java do I need to learn to use selenium webdriver? I am completely new to programming. 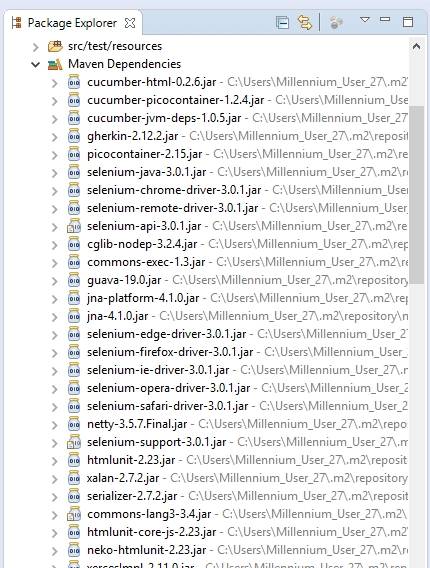 Can I still learn Selenium? 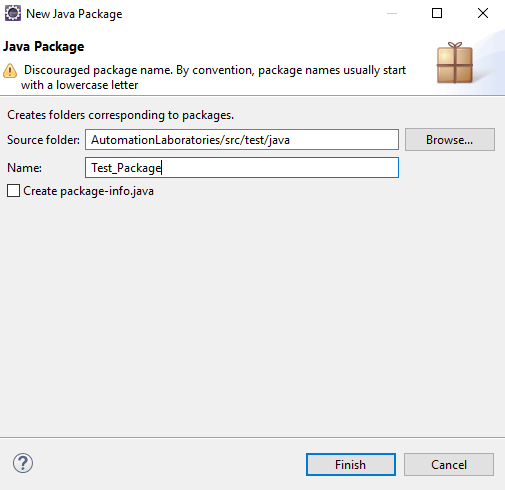 What is the best source to learn Java from Scratch? 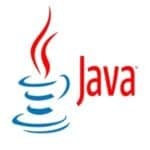 List of keywords, Interface in Java. Handle data types and usage of same. FirefoxDriver() - FirefoxDriver() is a constructor of FirefoxDriver class which implements all the methods in the present in the webdriver interface and this opens the Firefox Browser. driver - driver is reference variable , which refers the address space created on the heap. a non-static method present in the FirefoxDriver class, it accepts a string as arguments and the string should be the website address.The best thing about the method is it will not give control to the next line till the page loads completely. Most of the time when you open firefox browser with selenium, the browser will be in minimized mode but in few scenarios, we might want to maximize the window. we can maximize the browser window with help of:maximize() method present in the window class. We can get the size of the browser window by using the getSize() method present in the Dimension class and it returns the Dimension Class type value. We can get URL of the page the using getCurrentUrl(), it returns Url as a string. We can get URL of the page the using getTitle(), it returns Url as a string. We can get URL of the page the using getPageSource(), it returns Url as a string. 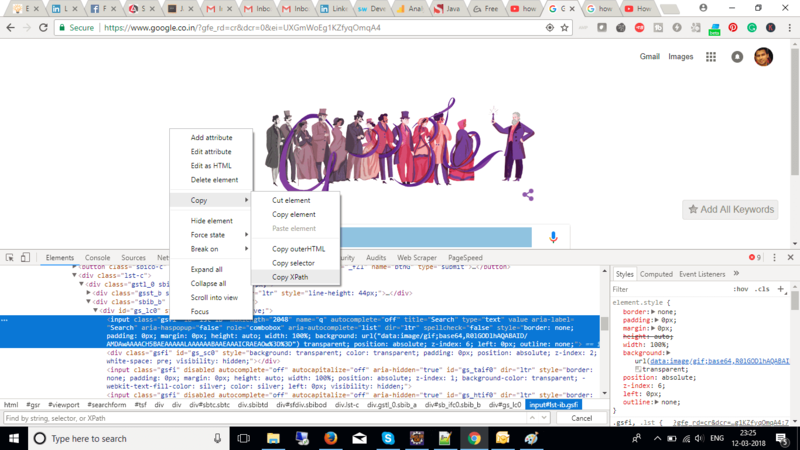 Chrome developer tools allow the user to find CSS, XPath values and also it allows the user to edit the DOM (Document Object Model) on the webpage.Changes done to elements of the DOM will reflect in the page immediately. Select More Tools > Developer Tools from Chrome's Main Menu. When we do one of the above-said things, Google opens developer tool like below. If you want to inspect any page, you have to click the inspector and choose the element, now it opens the source code. 1.Install Firebug from Add-ons present in Firefox Browser.Post Installation the icon with bug symbol would be visible. Locators provide a way to access the HTML elements from a web page. In Selenium, we can use locators to perform actions on the text boxes, links, checkboxes and other web elements.Locators are the basic building blocks of a web page. A web developer must use a proper and consistent locator scheme for a website. Also, a test engineer must choose the correct locator strategy to automate the online workflows.Selenium names eight types of locators to find the elements on a web page. It is a unique reference for a web object that the developer sets while writing the code. Ideally, the ID should not repeat on a page, but the browsers do allow exceptions to this rule. The ID is no doubt the best locator to use in Selenium. Still, if it belongs to an HTML table, then it’s possible that it would change or disappear from the list. Hence, you need to put in a more advanced locator technique. It is preferable to have a unique id, so it is unlikely to meet similar values. Feasible for elements with fixed IDs but not for the generated ones. Every form has input fields with unique names. Names are unique most of the times, but it’s not a restriction. However, a field name locator is the best choice for testing a login form. But when you have multiple login types on the same page then you should use locators with a different scheme. Let’s see the example where you can use either the id or the field name. It is more appropriate to use it when you have a list of similar types of elements. Using it with a dynamically generated list is tough. It is a perfect way to find the links on a page. <a href="http://www.google.com">How to use locators? It’ll only work for anchor tags. Use it for checking navigation flows. You need to provide the link text for it to work. It is almost similar to the previous locator. It differs in the way you use it to find the element. You can better understand to use this locator from the below example. The CSS class locator uses a specific class attribute to get to the first element on a web page. It is useful for items that own a unique style. CSS Selectors are no different than the XPaths. But they are resilient and powerful. Unlike the XPath, they aren’t dependent on the DOM structure. They can help you perform actions which are difficult to do with XPath. Relatively speedier than using the XPath. Its usage is growing as the web pages are getting more style-centric. It’s easy to define a unique CSS locator as you can combine multiple CSS attributes. XPath is a perfect technique for walking through the DOM structure of the web page. XPath locators are robust and reliable. It is one method which guarantees to locate any element on the page using the XPath expression. But you should be very careful while forming an XPath as it may not work if there are changes in the web application.We can classify XPaths in the following two groups.I- Absolute XPath.It starts from the root element within the web page or part of the page and goes to identify the target element. To use locators like the XPath is easy as you give the direct element path. But the XPath would break when the element structure changes.II- Relative XPath.The relative XPath are easy to manage as they are short and concise. It is also better than the previous XPath style as it may survive the changes in the Page HTML to a certain degree. Though, building a relative XPath is time-consuming and quite difficult as you need to check all the nodes to form the path. Guarantees to find accurate locators. It is slow as compared to CSS. It’s browser dependent, and there are differences in IE vs. Firefox XPath implementations.